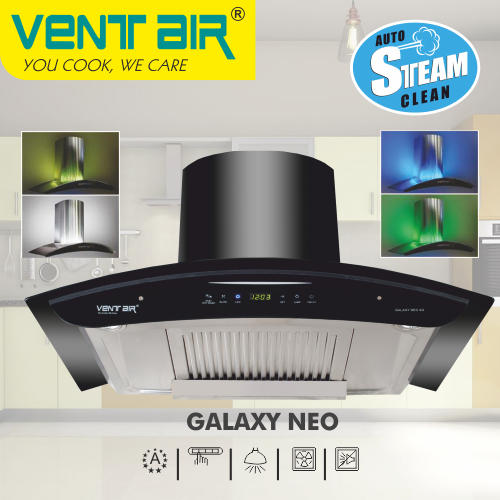 With Steam Clean Technology and color changing LED decoration, VENTAIR amazes you with this sophisticated premium rangehood, GALAXY NEO, designed specifically to awe you while bring you the provider of the cleanest smoke-free kitchen. With Steam Clean Technology and color changing LED decoration, VENTAIR amazes you with this sophisticated premium rangehood,GALAXY NEO, designed specifically to awe you while bring you the provider of the cleanest smoke-free kitchen. Being present in the market for over a decade, VENTAIR is a leading kitchen appliances brand in India today.We offer a a variety of products ranging from Kitchen Chimneys, Gas Hobs,Water Purifiers, Electric Geysers and Air coolers. Our products are widely appreciated for their reliability, robustness, splendid and supreme quality, perfect finish, and easy accessibilty all at extremely reasonable rates. Ventair has gained a commendable position in the industry by manufacturing quality oriented products. Our professionals work in close proximity to our patrons to comprehend their requirements. We keep a close watch on changing consumer’s preferences and are updated with the latest trends to keep ourselves relevent to our people. We have a research & development unit, which is engaged in designing upgraded range to cater the needs of our patrons. In addition to this, for the benefit of our clients, we offer different payment options to them like cash, DD, and online fund transfer. We aim to serve our people in the best way possible and make their kitchen experience happy and beautiful.